Book – The phrase ‘book of essays’ always suggests to me something stodgy, solemn and old-fashioned–until I remember that every Buzzfeed article is an essay by another name. Cover Me actually started as a series of posts on the author’s blog, and that pedigree shows, in a good way. It’s a compilation of nineteen bite-sized nuggets of popular music history, exactly the kind of irresistible stories that can keep a reader clicking through to the next page until the small hours of the morning. Author Padgett is a music producer as well as a writer, and his industry knowledge informs and enriches these impeccably-written essays. Even after many years of blogging on the subject of cover songs (songs re-recorded by a different artist than the original) he was hesitant to delve into the subject in book form, because cover songs are not exactly a unifying theme. They belong to no one particular era, genre or movement–but that fact in itself makes them an ideal vehicle for a macro-view of popular music as a whole, at least the past 65-ish years of English-language popular songs. “Every major change in the music industry since the advent of rock and roll finds some expression in the world of cover songs,” Padgett writes, and he does an admirable job of delving into those larger connections and significances to make each song tell a larger story. Moreover, he writes history the way it should be written: as a series of human stories, emotional and compelling as well as informative. As a casual music history fan, I was nervous that Cover Me would be a music snob’s book for experts only, but was pleasantly surprised. I already not only knew, but knew the words to, almost every song discussed, including all-time greats like Aretha Franklin’s “Respect,” Jimi Hendrix’s “All Along the Watchtower” and the Beatles’ “Twist and Shout.” This is definitely a book to enjoy with YouTube on hand, to listen (or, in the case of Johnny Cash’s “Hurt” and the accompanying music video, watch) along to every variation of the featured songs. Revisiting classics in this rich new way was a genuine joy, and I would recommend it to every teen and adult reader with even a slight interest in popular music or music history. Book–In Shrill, online columnist Lindy West shares a series of highly personal essays on topics ranging from abortion to being fat to her father’s death. The essays seem to be organized vaguely chronologically, but also with a progression from funny and light to more serious and vulnerable. My favorite of the essays was late in the book, a gut-wrenching account of Lindy’s experience with an online troll who, not content with the pedestrian vitriol usually lobbed at women on the internet, decided to pose as Lindy’s recently deceased father and insult her using his face and personal details. Also unlike other trolls, when confronted on how depraved his actions were, he sincerely apologized and gave some insight on what prompted his actions. Lindy’s brand of humor is crass, sharp, and laden with modern internet parlance; readers will either respond to it or they won’t. While I did enjoy her essays in this collection, I think that her writing is perhaps better suited to shorter form pieces and journalism. I found that her writing style becomes too abrasive to read for long periods and is best enjoyed in short chunks. If you enjoyed this collection, I would also recommend books by Jessica Valenti and Andi Zeisler. Book – Never mind The Force Awakens and its record-busting box-office numbers. If geek has really become chic, as popular wisdom would have us believe, then there is no surer sign of the fact than the existence of Luke Skywalker Can’t Read and Other Geeky Truths. Hold your head high and read it with pride, fellow liberated nerds of Warrenville, in the sure and certain knowledge, as author Ryan Britt puts it, that the geek has inherited the earth. In a series of humorous essays, each just the right length for a bite-sized lunchtime or before-bed treat, Britt shares his love of all things geek, from space operas to hobbits to superheroes. As a devotee of genre fiction in all its types and kinds–an unabashed geek, in short–I found a great deal of enjoyment in the familiarity of Britt’s experiences and fannish devotions (I love Jeremy Brett’s Holmes too, Mr. Britt, and I was right there with you on the weekly dose of delicious-but-depressing Battlestar blues!). Even if your speculative fiction experience begins and ends with Star Wars or The Hunger Games or Harry Potter, however, I think there’s a lot of interest to be found here. Some of the most fascinating essays to me were those that covered ground I wasn’t so familiar with, like “Wearing Dracula’s Pants”, about the history of vampire stories in print and on-screen. Other essays focus on Sherlock Holmes, Doctor Who, Star Trek, Back to the Future, Tolkien, movie music, and, yes, Star Wars, among many other things. It’s a playful, cheeky, joyous celebration of how and why we love the stories that have become our century’s particular mythology, and a massively fun ride from the first page to the last. 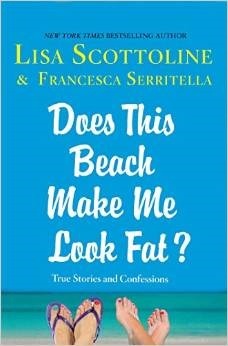 Book – Lisa Scottoline and her daughter Francesca share their witty observations and musings about the joys and trials of everyday modern life. They take on topics such as college reunions, leather loungers at the movie theater, diets, working out, family relationships, mice in the house, auctions, men and, as the title suggests, eating on the beach. The collection of short essays kept me laughing out loud, but was also heartwarming and endearingly honest. I felt like the authors were sitting across the table from me, sharing their stories. Francesca writes “I feel like I’m the last of my friends to try two things: online dating and therapy. I think I need both. Or more specifically, I think I need one for the other. I’m just not sure in which order.” as she expounds on the challenges of being newly single. Lisa shares “I joke about getting older, but the truth is, I don’t feel old. On the contrary, at age fifty-nine, I feel as if I’m entering my prime. So I’m either delusional or insightful. I’ll leave the choice to you. But let me make my case.” in discussing the evolution of our lives. The mother-daughter duo have written five other humor memoirs in this series. Lisa Scottoline is also the author of twenty-four novels, including her latest best-seller, Every Fifteen Minutes.